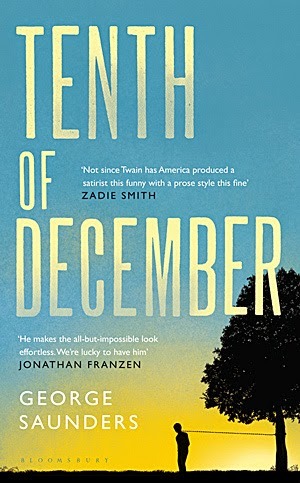 I finally read Tenth of December a few weeks ago, despite the fact that I bought a copy last winter and everyone I know had been raving about it. I'm glad I waited - it was exactly the book I needed in that moment, and was absolutely worth the wait. In this collection of ten short stories, George Saunders examines relationships, the future, and our weaknesses through a view laced with sarcasm and tenderness. I tore through these stories in the span of three days, but only because I forced myself to slow down. What I loved most about this collection was the reminder that short stories can be fun. Sometimes I get caught up in the seriousness of writing, the THEMES and the MEANING and the BEAUTY OF LANGUAGE. Which are all well and good, as I love those things, but sometimes you just want to romp through a collection, and romping is the best way to describe how I felt as I read Tenth of December. That's not to say this collection isn't also full of beautiful themes and language. It is, of course - there's a reason George Saunders is considered one of the best writers of our time. There were a few stories in this collection in particular that were absolutely dazzling, full of language that dipped and twirled, voices that delighted and disgusted. I loved the narrative leaps so many of the stories took, the brazen style that might feel gimmicky in a lesser writer's book. One of my favorites was the opening story "Victory Lap." The way Saunders completely immerses the reader in three separate characters' heads, as they each experience the same dramatic moment, was thrilling. The characters - a teenage girl, a teenage boy, and a bloodthirsty criminal - would have been sort of ordinary, if not for how deeply we're plunged into their minds. "Escape from Spiderhead," another favorite, is a futuristic story that starts out funny but gets very dark very quickly. The language here swings just as widely, especially once the narrator is given a drug that makes him more eloquent. I loved the way his vocabulary ebbed and flowed according the powers of the drug, so that the same character could say something like "Heather soon looked super-good" and then "our protestations of love poured forth simultaneously, linguistically complex and metaphorically rich; I daresay we had become poets" just a few paragraphs later. The pacing of this story was perfect, and the ending! So chilling, and so great. My favorite story, the one that grabbed me and wouldn't let go, was "The Semplica Girl Diaries." Told through the diary entries of a middle class suburban dad who aspires to give his family the kind of life he can't afford, his voice was touching and felt so real. I found myself invested in his struggle, completely understanding his urges and even his mistakes - until it becomes clear, over the course of the story, what lengths he's willing to go, and what horrors have been normalized in his world. (I'm trying not to give too much away, even though most of the reviews I've read do, because figuring out what the narrator wanted was one of the best moments of the reading experience. Go read it now, and then we can talk in more detail!) Basically, it's a dark and futuristic version of "keeping up with the Joneses," with chilling consequences. I really enjoyed this collection, and am so glad I read it when I did. Not only did it get me back into the habit of reading regularly, but it made me want to write short stories again. Read it, and let me know what you think!